Despite its similarity in sound to (Mc)Coffey or Coffee, the "roots" of this name are quite different, the (Mac)Caughey clan being from the Ulster region. The Gaelic spelling is MacEachaidy, "Eachaidh" being usually Anglicized to Aghy or Oghy, and as such it remains a rare Christian name in modern Ireland. The precise translation is uncertain, but it is probably "the son (Mac) of the youthful one", "Eachaidh" being equivalent to the lad, or boy, or similar. 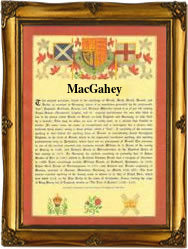 Various spelling forms exist, including: McGaughey, McGaughie, McGauhy, McGahey, McGahy, McGAffey, Megahey and Gaffey, and despite their varied spellings, all have the same source. It is said that as MacCahee, the clan was recorded in County Tyrone in 1685, however, in the modern forms early recordings include: John McGaihy (1719); Elizabeth McGahy (1711); Jane McGahey (1846); John Caghy (1791); Jennet McCaughey (1816); Lettitia McGaghey (1829); and Margaret McCaughey, of Aughnacloy, County Tyrone, on August 5th 1868. The first recorded spelling of the family name is shown to be that of Jas. M'Gachy, which was dated May 25th 1709, a christened witness at Carmoney, County Antrim, during the reign of Queen Anne of England, known as "The Last Stuart Monarch", 1702 - 1714. Surnames became necessary when governments introduced personal taxation. In England this was known as Poll Tax. Throughout the centuries, surnames in every country have continued to "develop" often leading to astonishing variants of the original spelling.